Piezo buzzers are one of the most common buzzers available around, they got their name from the piezoelectric material used as the active element. These buzzers are usually driven at a relatively higher voltage but low current, consumes a little power, but still capable of producing very high sound. How this piezo buzzer circuit works ? You’re going to need few very basic components for this simple piezo buzzer circuit. One BC548 transistor, or other similar NPN transistor. One self drive 3 terminal piezoelectric buzzer. 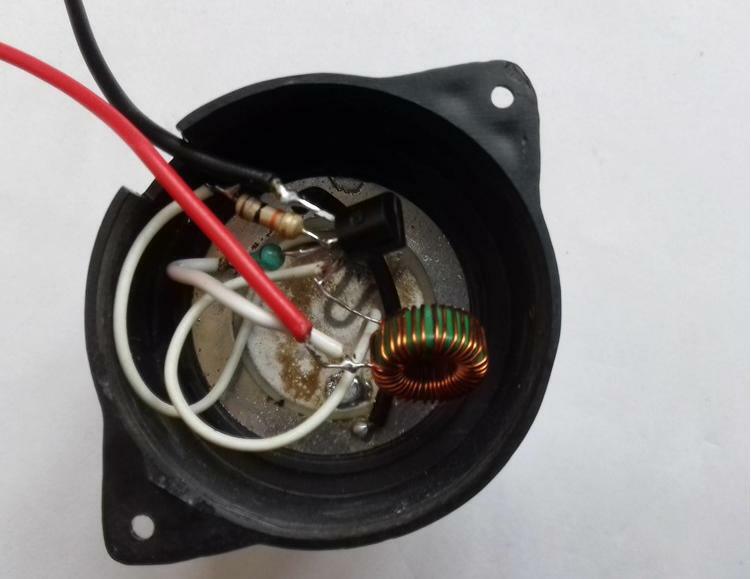 One 1-10mH inductor coil, details below. A power source of course, 6V to 24V. The Piezo element must be a three terminal one, like in the picture. The blue wire is connected to feedback(F) terminal, red wire to the main (M) terminal and the black wire to the piezo element’s ground(G) plate. The inductor coil’s value and shape is not crucial. You can use any coil from 1mH to 10mH or more, or even no measured value at all. I used a 40 turn coil on a small ferrite toroid in the final design. Note the piezoelectric element’s pinout, M is the main terminal, F is the feedback terminal and G is the ground plate. The circuit is fairly simple, you can use a little piece of strip board to make it. As this piezo buzzer circuit uses very few components, so it also could be constructed by soldering the components to each other. My sample prototype, I opted for soldering the components to each other. The wires connecting the buzzer’s Main and feedback terminal MUST be very flexible and thin, else the buzzer won’t work ! Why ? The piezo element produces a very little displacement, possibly in range of few micro meters only. The flex force ain’t that powerful to overcome the pressure from connecting wires. Did you notice the two copper coils in the above picture ? I used them to minimise the pressure from connecting wires, but it was pretty impractical. So later removed those and and soldered two thin and very flexible wires, that just worked. I also replaced the 5mH coil with a 50 turn coil on a ferrite toroid. Now all components fits nicely inside the buzzer’s housing. When A voltage is applied to the electrodes of the piezo element, they produces flex in either way. This flex force bends the ground plate up and down. The exact opposite thing happens too, when a a piezoelectric element is subjected to varying pressure, it produces voltage. 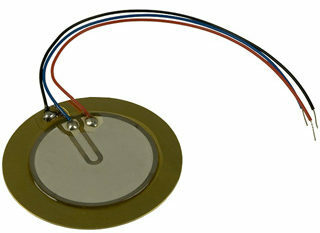 As you’ve seen before, self drive piezo buzzers are constructed with an extra electrically isolated feedback electrode. The voltage created by the flex force is available in the feedback terminal. 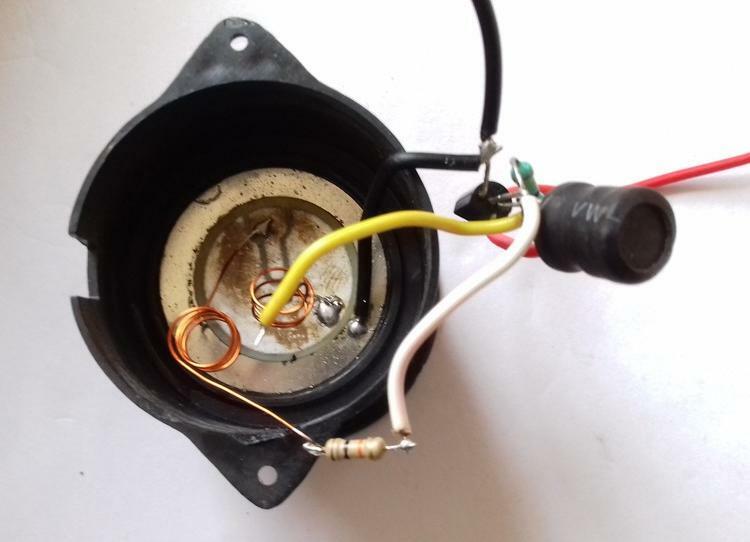 The piezo buzzer is placed in a resonant cavity, there is a hole in the opposite side of the resonant cavity from where the buzzing sound comes out. The driver circuit and piezo buzzer co-operates soon between themselves and they starts oscillating on the resonant frequency of the piezo buzzer. So that’s it, construction of a simple piezo buzzer circuit, I could write more about it’s operating principle, but that’s not necessary here. Need a buzzer that sounds good ? Here is the more pleasant sounding piezoelectric buzzer circuit . And what if you want to make a magnetic buzzer circuit ? If you’ve got some suggestion/question/problem, just leave a comment, I’d like to hear from you ! I have three battery operated alarm clocks (single “C” type 1.5V). As far as time keeping goes, all are near perfect. However the alarm mechanism has failed on all three clocks. The alarm mechanism consists of a small electric motor with a “T-bar” attached to its drive shaft. At the ends of the “T-bar” are small metal washers which I would refer to as clappers. These clappers strike a metal cup as they rotate and produce the ringing sound of the alarm. The fault, in all cases, is mechanical insofar as the clappers have fallen off the “T-bar” or have jammed and prevent the motor from rotating. By replacing the mechanical side of the alarm with some sort of electronic alarm would mean that I could effectively repair all three clocks so that they operated correctly. I feel that the mechanical bell type operation of the alarm could be easily replaced by one of the above circuits; the only problem being that the voltage available is only 1.5V. Do you think that any of the above would provide a viable solution? Hi John, it’s a wise decision to replace the mechanical bell with a electronic one, they’re much less prone to failure and of course, consumes less power. I’ll suggest you to use this one, “Simple magnetic buzzer circuit with UM66 IC” consumes less power compared to a piezo buzzer and smaller in size. UM66T IC works fine with a single 1.5V battery, but then you need to modify the circuit a little. hi.. nice and descriptive post. To make coil what was the SWG number of wire. and what else can be added to make the sound beep, beep ( means 1sec pause and on) thanks. You can make the coil by winding 20-40 turn of 28 to 30 SWG wire on a little ferrite toroid. The easiest way to get a beep beep sound use a UM66T IC. Or you can use a simple two transistor astable multivibrator, or a UJT relaxation oscillator. Hi, I’m doing a project for a class that is very similar to this we are trying to make an alarm system for a model house. The supplies we were given where a 470k ohm resistor, solar power, a 75 decibel piezo buzzer, and wire. We have set up the circuit and it works but we want the buzzer to go off when the wires are disconnected, any ideas on how to do this? 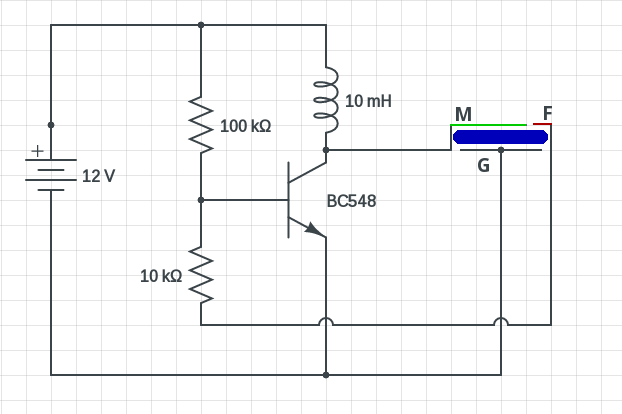 First, 470kOhm resistor is too high, and what is a solar power ? Is it a solar panel ? If the buzzer is self driven, then you can just connect it to the solar panel, it will start making sound. I’m trying to make aVERY simple buzzing circuit for a school project. I wanted a flat buzzer b/c the buzzer is supposed to be in a book. I’m using only a piezoelectric sounder 6.4KHz resonant freq 6.3 KHz and a 3 volt battery. Connecting the sounder to the battery or to copper foil doesn’t work. Any suggestions? Can you also specify the type of buzzer element you’re using?